During the night, the face of The City of Lights was changed. For much of the world, Notre Dame symbolizes Paris and indeed, France. As my home is located on the Mediterranean, I relied on the photos in my local morning journal (newspaper). Like many, I had been forwarned last night by the internet. But seeing what is available on my computer or television cannot compare to the stunned faces I encountered this morning. One neighbor retired barber, extended a near usual morning greeting. However, today, his cheeks were streaked with tears. While this is a UNESCO World Heritage Site, this marks a National, European and even World Wide loss. Without a doubt, she has been one of the top visited locations in France. Having lived here for nearly twelve years, I’ve witnessed loss and mourning in my village. This is different. It is a loss shared by the entire nation and beyond. Television, radio and the internet will be filled with photos and stories for some time. No doubt, efforts will be made to restore the cathedral as close as possible to its former glory. Lost art and relics have left a space for new treasures that will try to capture some of her past and a glance toward the future. While the nation is grateful for what was spared and the fact there was no loss of life, there is also the deep sadness for what is gone. Come visit this beautiful old town for some kayaking, swimming and delicious food! Don’t forget to click on the photos to enlarge them. 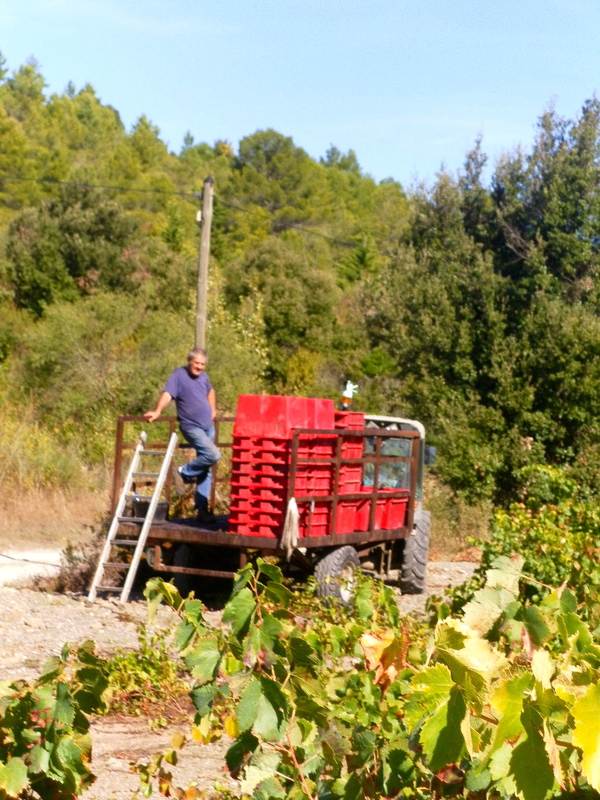 It seems that most everyone here is involved in La vendange (grape harvest). 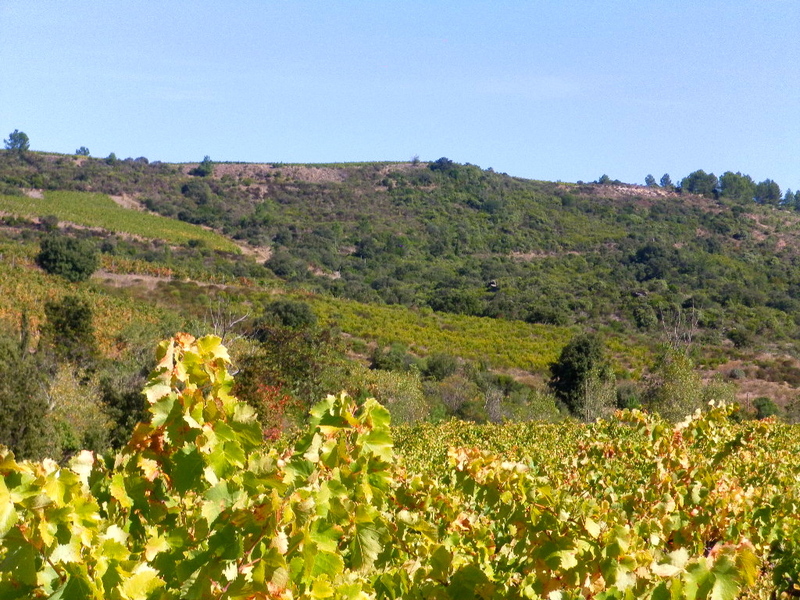 More grapes are grown in this region than anywhere else in France. 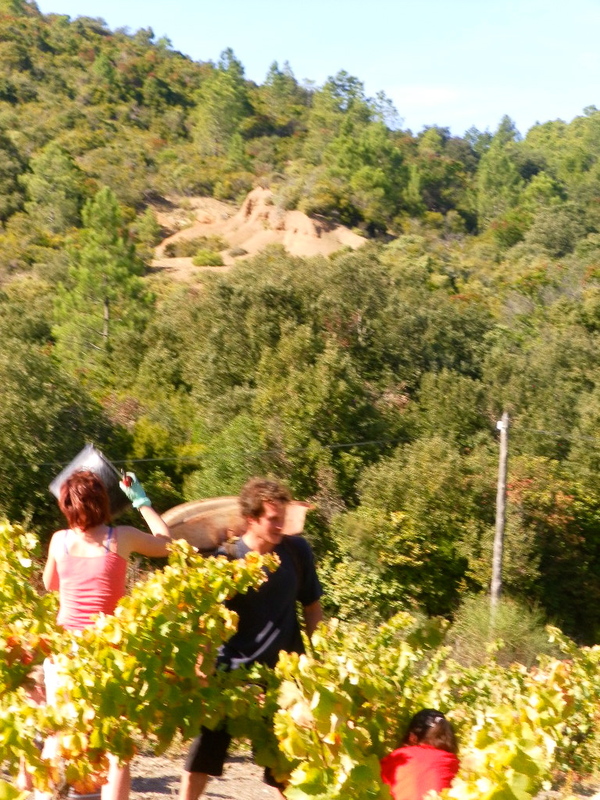 Even before the last of the grapes are picked, the celebrations begin. The festivities seem to never end as each village hosts its own so there is always one to attend, throughout November, and sample the wares. While it seems that increasing numbers are being picked by machine, much of the land here is just too steep for them. It is backbreaking work and the cutters used to take the fruit are very sharp. 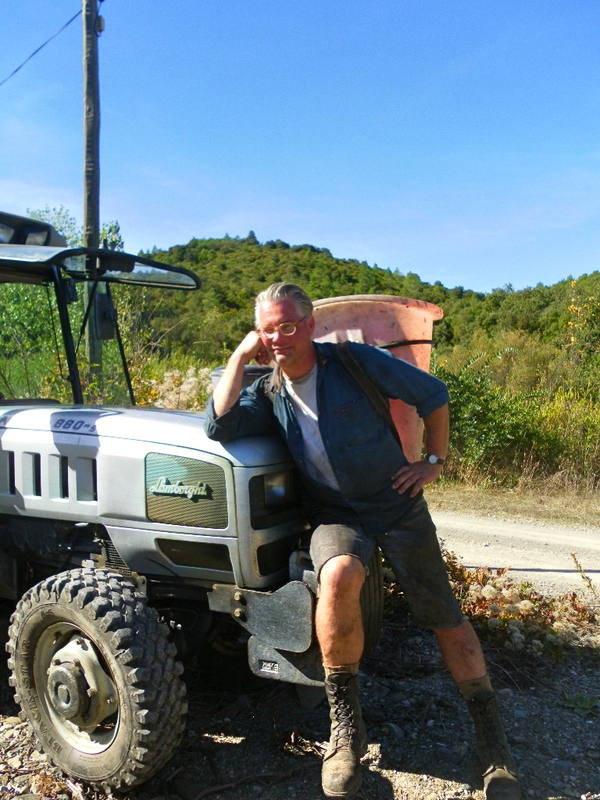 It is almost a rite of passage that young people from other parts of Europe head down to the vineyards of France to pick grapes and enjoy the country. 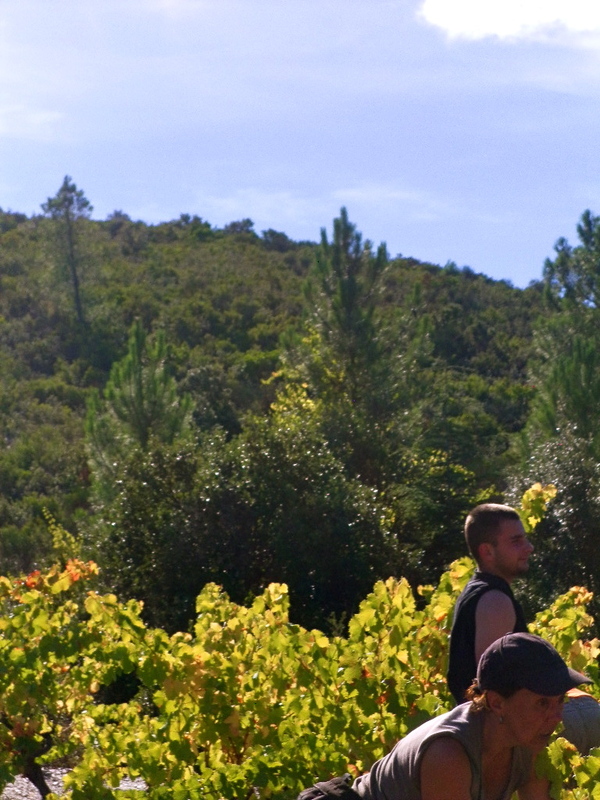 At the end of the vendange, our village hosts a dance. 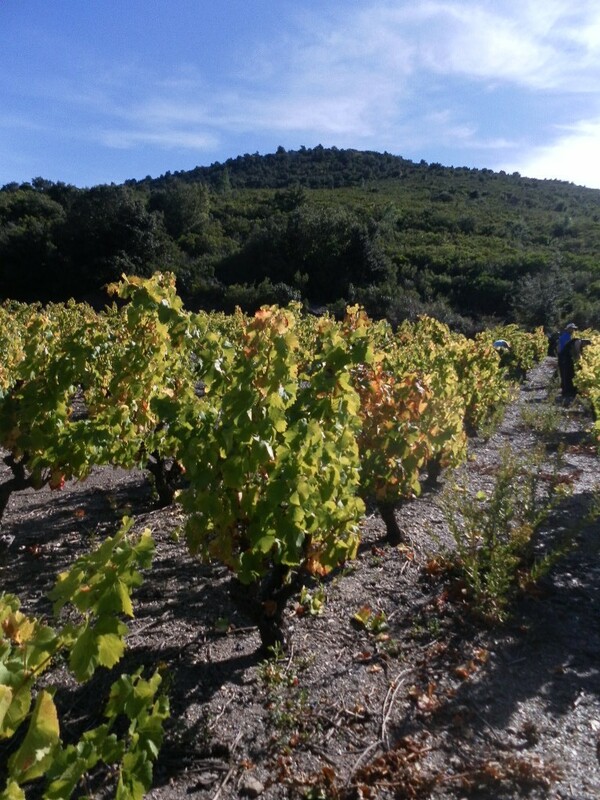 The wine festivals come later but since there is no set time for vignerons to begin their harvest, it will usually stagger over the months of September through early November. 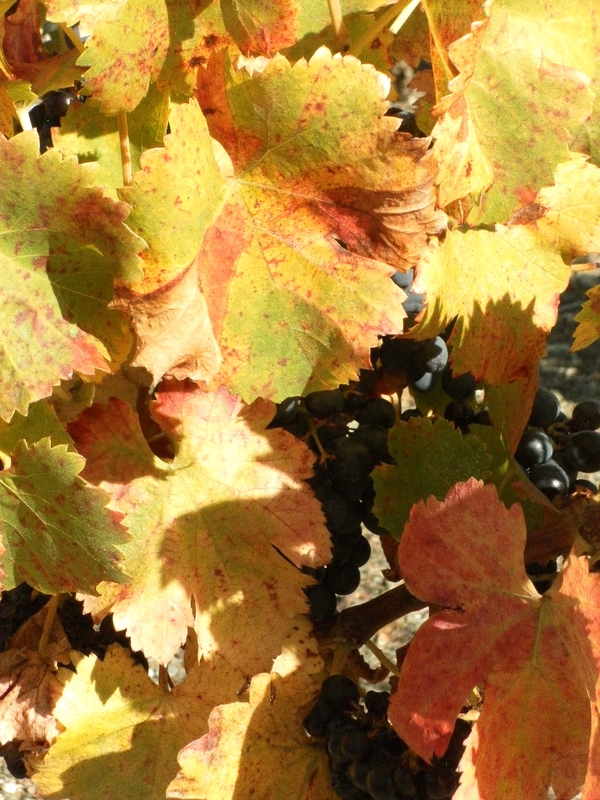 There are places like Leucate where they produce a Muscat (often very sweet) and begin in the August heat! range of reds, white and delicious rosé. He will not get any argument from me. While it would have been lovely to get inside the vin cave to photograph the process, it is just to busy and I would have only been in the way. Perhaps there will be a future post inside? 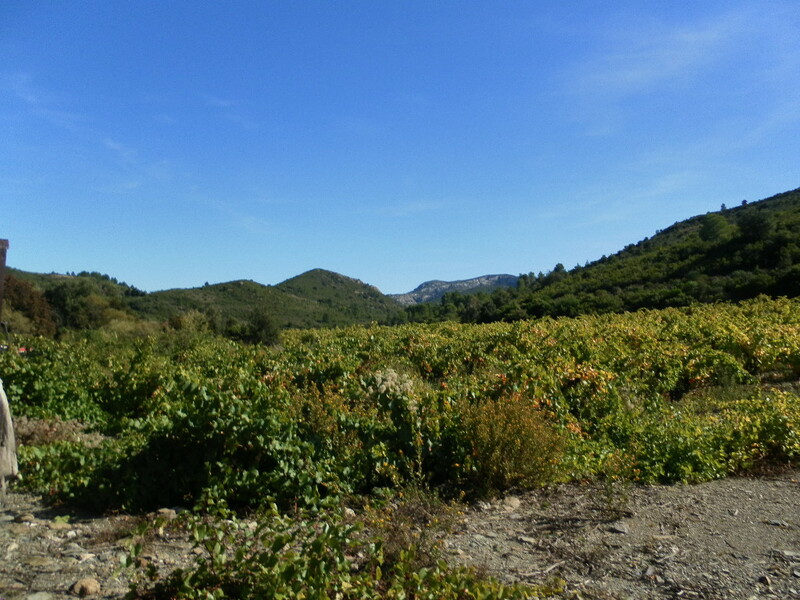 During the vendange, you can barely get into the little shop where you can buy a bottle of Trois, Pompador or any of their other delicious wines. One of the pickers is a charming woman named Paloma who was asked to help out a few years ago and said she would give it a go! While many of the pickers are young, they are by no means the entire force. 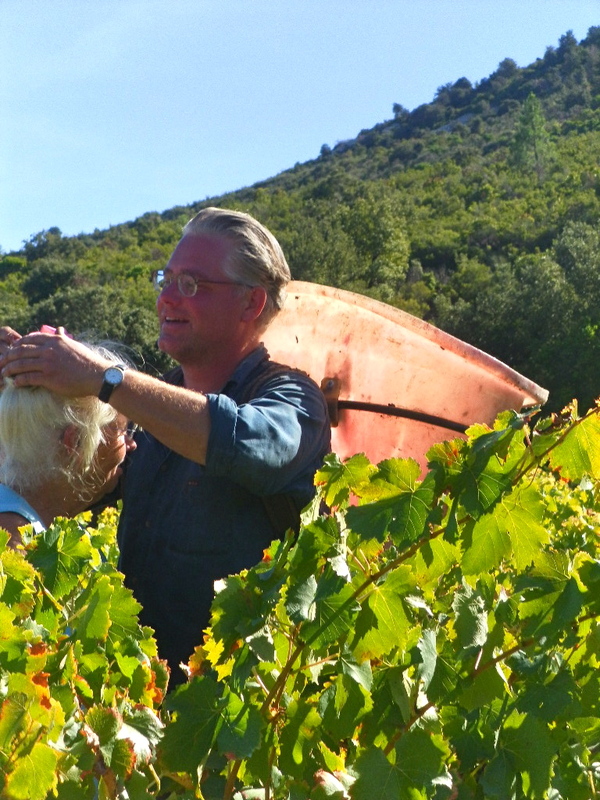 At the beginning of the day, Cees walked up to Paloma and tried to secure a lovely pink rose in her hair. With all the bending, it didn’t last too long but was a lovely thought. which fill rapidly with the grapes and need to be emptied and carried off to the waiting trailers. Each of the containers holds between 50 to 60 kilos of grapes. Imagine yourself carrying around over 100 pounds extra on your back in the hot sun all day. 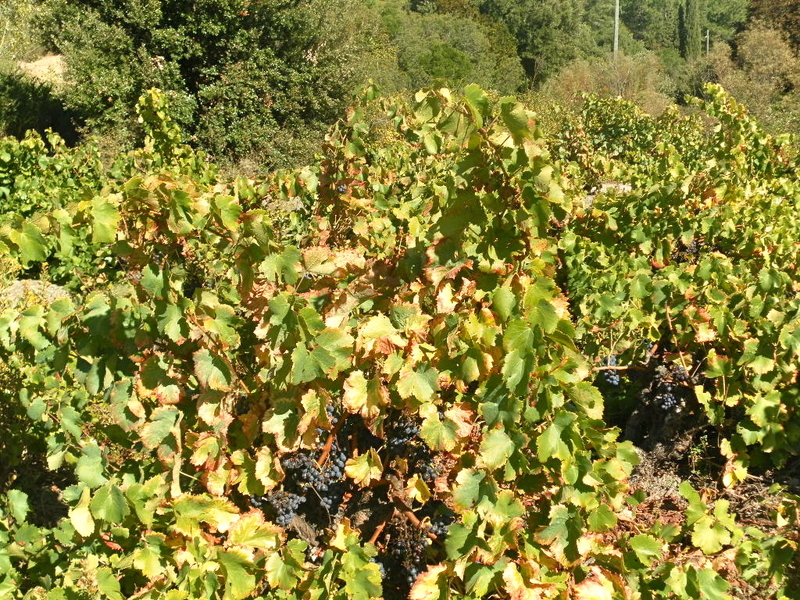 There was evidence of feasting by sangliers (wild boars) they can do a lot of damage to the vineyards. 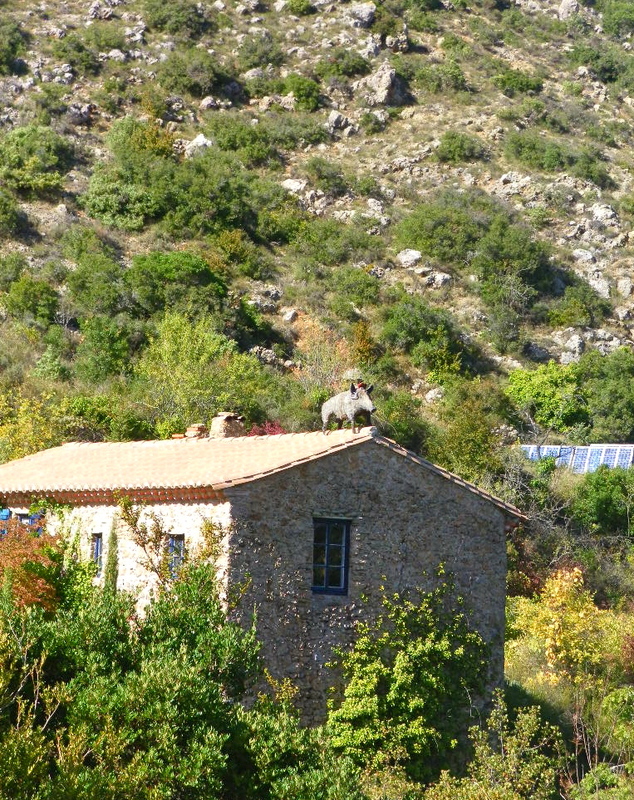 One local hunter went as far as to have one stuffed and mounted on the roof of his bergerie (sheepfold) where he lives. The unlucky sanglier will end up on a plate and are considered good eating. Yes! People do live in old bergeries here. 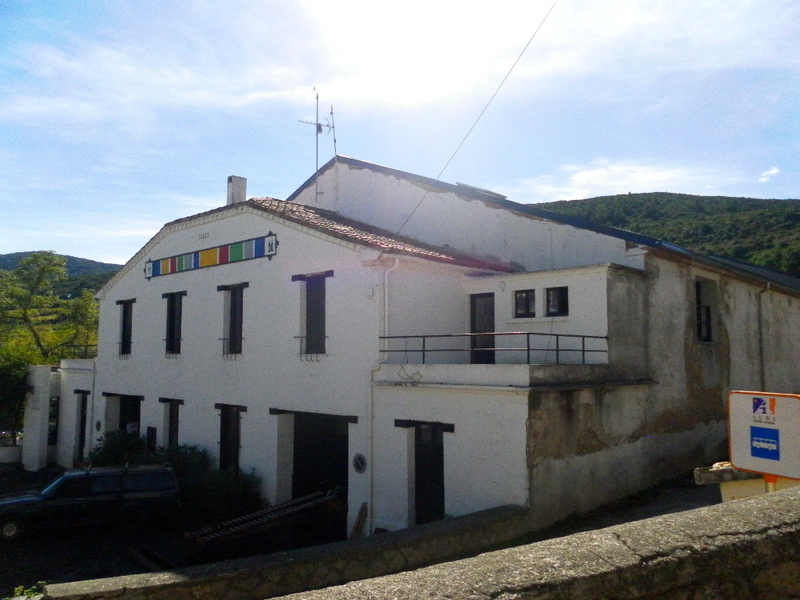 They buy them, renovate and sometimes extend the sheepfold into charming and comfortable homes. However, that just may be another post? Our friends at Fandango have thrown down the gauntlet. The challenge, On The Street Where I Live. You can visit them at: https://fivedotoh.com/2018/08/01/on-the-street-where-i-live/ Thank you Fandango. While France may not be the land of my birth, it is the home of my heart. Most of the opposite side of our street is the wall dividing between village and the river. The old pharmacy is for sale and has much to offer. It would be ideal for a business with residence above. The old café is for sale as the new owners moved it down the road so they had more room and plenty of outside space. Upstairs is a working hotel. Stop and smell the roses, or whatever else is in bloom and perhaps a sprig of rosemary. The bank is to the left but we shall stay on my street. Bibliothèque (Library) During the summer months it also doubles as the Tourist Office. Alas, it is a long road that I live on. What you see here, barely scratches the surface and at best, I shall hope it tempts you to visit the small villages in France. We have much to offer. In part two of the “hidden” art expo here in Albas, we begin with sculpture and photos in a charming little courtyard. If you would like additional information about this annual exposition or any of the artists, please visit the site of Eurocultures: https://eurocultures.fr/festival-dart/ They may be able to assist in questions regarding the artists or perhaps you would be interested in showing your own works here. This tiny courtyard with his charming fence is on permanent display. If you go back four or five years ago in these posts, you may find this same village feature. Creativity is everywhere in this lovely little village and imaginations run wild, as they should. As in the previous post, I once again apologize for the uneven subjects. As in my own home, there are few level surfaces and many rooms are not ‘squared’. Additionally, I would never presume to adjust any of the works nor even touch them. I’ve seen a few of the artists setting up and this location and others. They do their best with the surfaces as they are. Despite that, I find their works very worthwhile. Léo de Faucher’s work is well worth the trip, wherever it is. Unfortunately there is no available contact information and I highly recommend you direct any questions regarding the art/artist, to Eurocultures (link above). I shall leave you with a few more photos of this lovely little village whose secret places are opened up to us this one weekend a year. Additionally I invite you to join us in the future. "If you have a garden and a library you have everything you need."